The lighting in Nobhill Tavern is highly unusual. Take, for instance, the large cylindrical pendant lights in the lounge area; they are attached to the ceiling in a single row, making for a very long lighting fixture. The same arrangement is again repeated in five rows of five in the dining room. Each long cylinder is covered with a lightly patterned shade. These are primarily sunset hued, with a circular disk at the bottom that reflects light up on the ceiling. 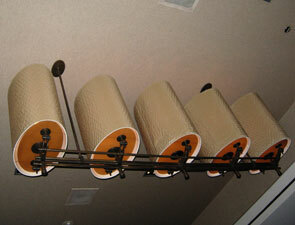 These five are placed so that each circle of light on the ceiling overlaps to create a beautifully romantic feel. These rows of five are suspended from the ceiling by two rod-like structures and linked together by similar rods that are attached by very small arches to the colored disk. The whole effect is calming and elegant. Table lighting isn't just beautiful at Nobhill Tavern, but also conventional. 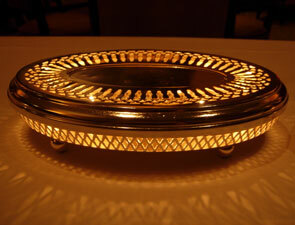 The centerpiece is elliptical shaped, featuring silver-colored metal mesh around the sides surrounding a solid center. You'd never know it, but this table lighting, lit by candles inside, is also used as a heating element to keep Nobhill Tavern's fresh bread and signature whipped potatoes warm. The mesh around the side is diamond like, and the food is placed on top; you'll still have light in the table, but your food will stay warm. This unique fixtures is elegant and functional, without being ostentatious.